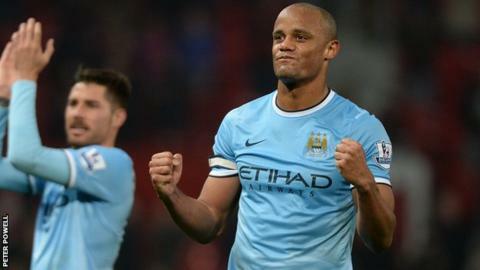 Manchester City captain Vincent Kompany has signed a new five-year contract with the Premier League champions. Kompany, 28, joins Aleksandar Kolarov,David Silva and Samir Nasri in committing his future to the club this summer. The Belgium international said: "When I arrived in 2008, I could never have dreamed that we could achieve what we have over the last six years. "But this is just the start of the journey." Vincent Kompany has scored 11 Premier League goals for Manchester City since joining in 2008. Kompany has been named in the PFA team of the year on three occasions. He was captain of Belgium during this summer's World Cup finals in Brazil. His brother Francois had a brief spell at Macclesfield Town in 2010. Kompany has made more than 240 appearances for City since joining from German side Hamburg in 2008. He has captained the side to two Premier League titles, the FA Cup and the Capital One Cup. Kompany told the club's website: "This team is stronger now than it's ever been; we have competition for places in every position and a dressing room full of exceptional, motivated people who want to continue making history together. "We have a common goal and so much to look forward to, why would I go anywhere else?" Kompany signed a new six-year deal after the club won the 2012 Premier League, but his new deal will keep him at the Etihad Stadium until 2019. City won the Premier League by two points last season, and begin their defence against Newcastle on Sunday.